The former Cirino’s restaurant building on Broad Street is in escrow, and it could wind up as a swank cocktail lounge, Sierra Foothills Report has learned. Real estate agents confirmed the building at 309 Broad Street was in escrow but declined to comment further. The would-be buyer has visited City Hall, however, inquiring about the possibility of turning it into a tastefully appointed cocktail lounge, along with good food, according to city officials. Specialty cocktails and “mocktails” (cocktails without alcohol) are booming. More details are here. The would-be buyer is experienced too: already operating similar establishments in Northern California. Each one has its own individual character, however. The building has been on the market for the first time in more than three decades. 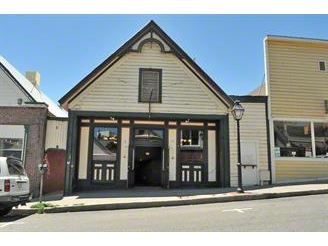 Formerly the home of Cirinos Restaurant, this premiere, downtown building has been a Nevada City icon since the 1800s. We hope the deal closes, we support the concept, and we hope it can bring some renewed vibrancy to upper Broad Street. In addition, Spring Street is being revitalized as an Arts District, with the new Bridge Street Project linking KVMR and the Nevada Theatre, along with the DANK at Osborn/Woods Gallery. We also reported exclusively that a coffeehouse called FoxHound Espresso is opening next door to the Nevada City Winery. Let’s hope upper Broad Street can follow suit. Quite an undertaking considering the price of the property, the cost it’s going to take to renovate and the volitile climate of the restaurant business. But I wish them much success and will certainly patronize there business! It’s just the right kind of buyer to renovate this building. We will patronize it too. With the “action” on Lower Commercial (Three Forks and the Wheyward Girls Cremery) and Spring Street (Bridge Street and DANK), Upper Broad is on its way! http://youtu.be/s62MrU8mHx4 LOL! Our DANK meeting yesterday ended with talk of wishing for a Moscow Mule and various other cocktails we’ve had over the years. It was like a fairytale wish come true to see this. Thanks Jeff, keep us posted! As long as it isn’t another coffee shop. That is such a good spot with nice bar it is a shame it has stayed empty for so long. Not when you consider a $300,000 amount to bring the building up to the current code. The Broad Street rumor is the owners have bars in S.F.. We have needed a lounge type bar for many moons 🙂 I hope the music will be lounge type and they know how make a proper martini along with the proper vermouth. Good Luck and Cheers to the new owners ! OMG. “San Francisco values.” ROFLOL!